The Haridasa (Kannada: ಹರಿದಾಸರು, literally meaning "servants of Lord Hari") denotes a devotional movement that marked a turning point in the cultural history of India. Over a span of nearly six centuries, especially between the thirteen century and fourteenth century C.E., Haridasa saints and mystics impacted the culture, philosophy, music, and art of Karnataka and the rest of South India. Some Haridasa saints wandered as bards, singing stories to convey their message. In that endeavor, they gave birth to Kannada literature and Carnatic music. They sought to use the language of the people to spread the ideas of bhakti through songs, literature, art, and philosophy. Incidentally, they conveyed other grand Hindu concepts to the common people, including consciousness (jnana), ethics, and the fundamentals of Hinduism. Their work created a renaissance of Hindu culture during the same time as the Renaissance in Europe, a renaissance that had a profound impact on Indian civilization in Southern India. The founders of the Haridasa movement shared a common goal. They sought to teach the Hindu doctrine of bhakti (Hari bhakti) to the common people, to all people. Their campaign to spread Hinduism through Hari bhakti during the thirteenth through seventeenth centuries, the time of the Vijayanagara Empire, provided tremendous dividends for the Indian people. Hindu philosophers like Sripadaraya, Vyasathirtha, Vadirajatirtha, Purandara Dasa and Kanaka Dasa played a leading role in propagating Haridasa using the Kannada language. That elevated the use of the Kannada language. The origin of the Haridasa movement remains unclear. Some legends indicate that they may have begun with holy men and kings espousing this form of devotion as early as the ninth century. The great Vaishnava religious devotionalism called Dasa Kuta found its organizational base and started to produce large congregation of devotees in the Karnataka region. Vedanta, propounded in the thirteenth century by Madhvacharya of Udupi (1238-1317 C.E. ), played a large role in the development of Dasa Kuta. The Haridasas, who propagated the philosophy (Vedanta) of Madhvacharya, belonged to two groups. First, the Dasakuta, who conveyed the philosophy of Madhvacharya in simple and lucid Kannada to the people. And the Vyasakuta, who were required to be proficient in the Vedas, Upanishads and other Darshanas. During that period, the movement became a strong spiritual force which helped a resurgence of a strong Hindu sentiment in Southern India, when Northern India already struggled under Muslim rule. The Haridasas' found state patronage in the Vijayanagara Empire which ruled over entire Southern India at its peak. Vyasatirtha held an intimate association with the empire, considered the family deity (Kuladevata) by King Krishnadevaraya. Haridasas' belonged to the Vaishnava school of Hinduism and worshipped Vitthala, a manifestation of Vishnu and all forms of Krishna. The Vittalanatha temple at Pandharapura on the bank of the river Bhima in present day Maharashtra, the Vittala Swami temples at Hampi in Karnataka and the Srinivasa temple on Tirumala hills in Andhra Pradesh stand out as the holiest of places in the Haridasa movement. The Haridasas' generally hailed from places in present day Karnataka, but Jayatirtha who came from Mangalvedhe near Pandharapura in modern Maharashtra and Sri Naraharitirtha (a disciple of Madhvacharya) and a native of either Andhra Pradesh or Orissa represent two notable exceptions. Naraharitirtha (1281), a minister in the court of Kalinga, joined the Madhvacharya order. He composed many early devotional hymns in praise of Vishnu in Kannada language, some available today. While the Srikurmam inscription indicates that Naraharitirtha may have been the originator of the devotional movement, the songs of the Haridasas' give credit to Sripadaraya as the real founder of the movement in the fifteenth century. Vadirajatirtha (1480-1600 C.E.) (lived for 120 years). Sripadaraya, Vyasatirtha, and Vadirajatirtha have the epitaph the "three great saints" (yathi trayaru) in Haridasa movement, where as the epithet "great trinity of Vaishnava composers" from Karnataka goes to Sripadaraya, Purandaradasa and Kanakadasa. That separation has proven somewhat difficult since their literature, music, devotion wed with their composite writings. Hampi had been the center of their activity in the fifteenth century and sixteenth century, the sacred center of Vijayanagara, the regal capital of Vijayanagara empire. The Haridasa movement gained further impetus in the seventeenth century and eighteenth century in and around Raichur District and some of the great saints from this era were Guru Raghavendra, Vijaya Dasa, Gopala Dasa, Jagannatha Dasa, Prasanna Venkata Dasa, Pranesha Dasa, Venugopala Dasa, Mahipathi Dasa, Mohana Dasa, Helevanakatte Giriamma, and Harapanhalli Bhimavva. The history of the Haridasa movement from the thirteenth century to the present day constitutes the history of spreading Hari bhakti (devotion to Hari-God) to the common man. In that purpose, Haridasa has contributed immensely to Kannada literature and to the development of Kannada language. Both the Haridasa and Veerashaiva movements pervade the length and breadth of Karnataka and exert ennobling influences upon the neighboring provinces of Andhra Pradesh, Tamil Nadu, and Maharashtra. Haridasa movement has made a significant contribution towards Kannada literature by spawning a whole corpus of devotional literature in the form of verses, hymns, and musical compositions, rendering the spread of the Dvaita philosophy (Vedanta) postulated by Madhvacharya. The literature that originated from that devotional movement has been named Dasa Sahitya (or dasara padagalu—literature of the dasas). Those various compositions generally have been called as Devaranamas (literally meaning "names of the Lord"), sung in the praise of the Lord Hari. All those compositions have the concept of Hari Bhakti (devotion to God) at their core and they usually revolve around references to Hindu mythology and the Dvaita philosophy. Some Haridasas, like Purandara Dasa and Kanaka Dasa, also composed several Devaranamas using the day-to-day happenings, morals, and virtues as the central theme. The authors composed them in the Kannada language, since they had as their main objective to present the devotional philosophy to the common man. In doing so, the common people gained education in the importance of consciousness (jnana), devotion (bhakti), ethics, and Hindu religion. Their hymns (padas) set to various musical tones (ragas) aroused the fervor among the general population. As advocates of religious reform, the Haridasas' propounded the virtues of detachment (vairagya). They utilized similes and metaphors to great effect in achieving that, finding in abundance in songs and hymns. The Haridasa movement developed the Carnatic music tradition as a distinct art form from the Hindustani style thereby heralding a renaissance in the world of Indian classical music. Purandara Dasa, one of the foremost of Haridasas', earned the title the "Father of carnatic music" (Karnataka Sangeeta Pitamaha) for his invaluable contributions to this art form. He composed prolifically. Historians calculate that he composed as many as 75,000-475,000 songs in Kannada language, though only a few hundred survive extant. Purandara Dasa composed several Keertane which later served as the foundation for the Kriti form, elaborated and perfected by the Trinity of Carnatic music. He codified and consolidated the teaching of Carnatic music by evolving several steps like sarali, jantai, thattu varisai, alankara, and geetham and laid down a framework for imparting formal training in that art form. The structure and lessons he formulated four centuries ago remain the foundation for all students of carnatic music. 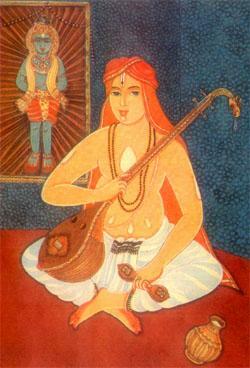 In addition to Purandara Dasa, several later Haridasas' composed songs adhering to the same musical and philosophical traditions. Their compositions usually fell in one of the following categories: Padagalu (or Devaranama—devotional hymns), Kriti, Ugabhoga, Suladi, Vruttanama, Dandaka, Tripadi (three line poetry), Pattadi, Sangathya, and Ragale (lyrical verses in blank verse). Those forms of composition are still prevalent in South India and especially in Karnataka. Although those compositions usually adhere to the carnatic style of music, musicians such as Bhimsen Joshi and Gangubai Hangal have sung some of them in the Hindustani style. ↑ Arthikaje, The Haridasa Movement. Retrieved July 5, 2008. ↑ 2.0 2.1 Jyotsna Kamat, Dasa Sahitya or Slave Literature. Retrieved July 5, 2008. ↑ Rao Pujar and Budihal, Sri Jaya Tirtha. Retrieved July 5, 2008. ↑ 4.0 4.1 Rao C.R. Mahushudhana, Sri Narahari Tirtha. Retrieved July 5, 2008. ↑ Jyotsna Kamat, Dasa Sahitya or Slave Literature. Retrieved July 5, 2008. ↑ Jytosna Kamat, Kanakadasa—Poet among Saints. Retrieved July 5, 2008. ↑ Madhusudana Rao CR, Haridasa Lineage. Retrieved July 5, 2008. ↑ Mahushudhana Rao C R, Ankitha. Retrieved July 5, 2008. ↑ Kamats Potpourri, Purandara Dasa. Retrieved July 5, 2008. ↑ Madhusudana Rao CR, Sri Purandara Dasaru. Retrieved July 5, 2008. Arthikaje. The Haridasa Movement—Part 1. Retrieved July 5, 2008. Kāmat, Sūryanātha. A Concise History of Karnataka: From Pre-Historic Times to the Present. Bangalore: Archana Prakashana, 1980. OCLC 7796041. Nilakanta Sastri Kallidaikurichi Aija. A History of South India from prehistoric times to the fall of Vijayanagar. 1955. ISBN 0195606868. Panchapakesa Iyer, A.S. Karnataka Sangeeta Sastra. Chennai: Zion Printers, 2006. Sharma, B.N. Krishnamurti. History of the Dvaita School of Vedānta and Its Literature: From the Earliest Beginnings to Our Own Time. Delhi: Motilal Banarsidass, 1981. ISBN 8120815750. This page was last modified on 30 January 2014, at 15:25.